Our 10" Leather Bench Mountable Strops are made of leather bonded to a solid hardwood base. The base has screw holes already drilled to make mounting to a bench easy (mounting screws not included). The leather area on our 10" Leather Bench Mountable Strop measures 10" x 2" in size. The total length of the strop is 13". Each of these leathers accept honing compound. We recommend our Green Honing Compound. The leather strop isn't new to sharpening but it is still confusing to some. Like a razor strop, the bench strop is used to put a very fine edge on your blade. Barbers have been using leather razor strops for decades to keep an extremely sharp edge on their straight razors. The razor strop is an essential tool for any barber or anyone needing to keep a straight razor sharp enough to shave with. While a razor strop can be used to sharpen a traditional knife, it just isn’t the right tool for the job. 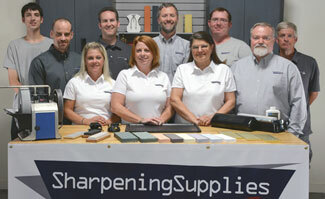 For putting the final edge on tools and knives, we recommend a Bench Strop. After sharpening your knife or tool on a bench stone, we recommend finishing it off with a bench strop for an extremely sharp edge. Just think of this strop as your finest stone. 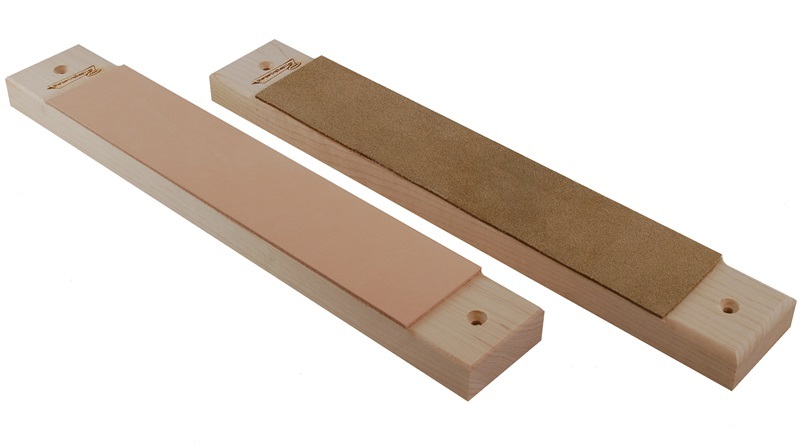 Strops can be made with smooth leather (grain side) or suede leather (flesh side). When deciding which one to carry we had to consider not only our own preferences but also the preferences of others for woodworking tools, carving tools, and knife sharpening. We even put them to a performance test and in the end, either one worked great. Instead of just carrying one type, we decided to carry both. Q. Will the smooth or rough side provide a finer edge? A. We have not found the edges to be noticeably different. The firmer leather of the smooth side will in theory keep a tighter angle tolerance than the rough leather. Keep in mind in both cases, this is the finest and last step in sharpening and the tool or knife will be as sharp as it can possibly be. Q. I can't make up my mind on whether to purchase the rough or smooth sided strop. Can you help? A. If everything else is equal we offer this suggestion: if you have a knife... get the smooth, if you have a tool... get the rough. This seems to be what people prefer. Of course, you could always get both by choosing a 12" Double Sided Paddle Strop.